Listing courtesy of Luke Anderson (CalBRE #01953489), Compass. Newly completed Spanish Contemporary home exquisitely designed with luxury fixtures & finishes. This rare offering features an open floor plan and beautifully designed custom cook’s kitchen with high-end appliances. 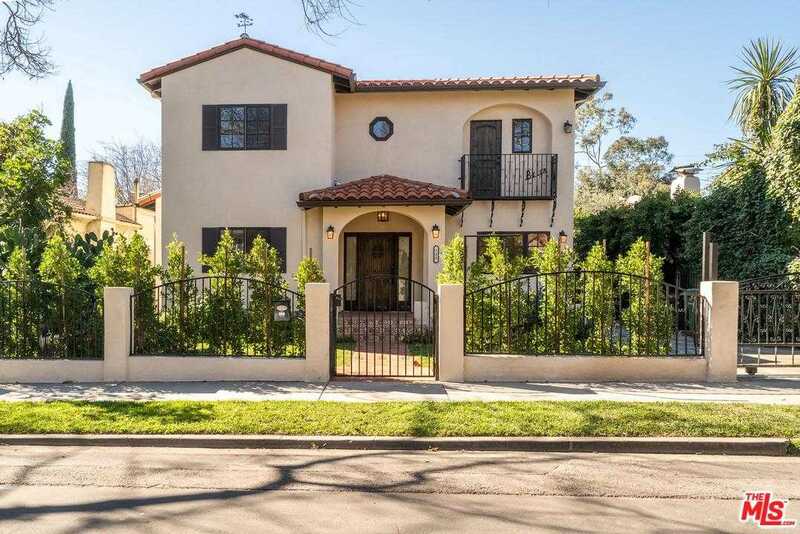 The owner spared no expense building a quality home with extraordinary details: from handmade, imported Talavera and Saltillo tiles; to solid, ~-inch oak floors and a large master bedroom suite with his & her closets and a mother-of-pearl shower wall. A private balcony overlooks a luxuriously landscaped back yard with an oversized pool, outdoor shower, and a cabana for indoor/outdoor entertaining and the ultimate California living experience.The home is located within walking distance to some of LA’s best restaurants on Melrose and Highland: a 3 minutes’ walk to Mozza & Pizzeria Mozza; and less than a minute to Eric Bost’s eagerly anticipated Auburn. Building size: 2850 sq ft.